Sauternes are late harvest wines from a region in the southern part of Bordeaux, and are a blend of Semillon, Sauvignon Blanc and sometimes Muscadelle. They are naturally very high in sugar and do not have any alcohol added to them like Port. Common flavor characteristics for Sauternes: dried pineapple, apricot, caramel, vanilla, honey and peach. 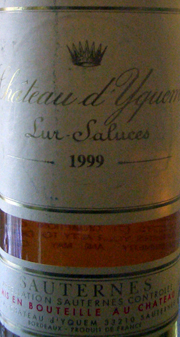 Sauternes are naturally very high in acidity, which balances the sugar very well. Sauternes have the ability to age for decades (due to the high sugar and acid levels), and they generally pick up more nutty and caramelized flavors as they age. While Sauternes go very well with fruit desserts and things like crème brûlée, they are not only made for dessert. The acid cuts right through fat, and the sugar is a great match for salt. For this reason, one of the best possible food and wine combinations is Sauternes and foie gras (goose liver). If you're at a restaurant that has some foie gras as an appetizer, go ahead and ask what Sauternes they have by the glass and try one out. It is truly an amazing flavor combination. Click here to see recipes that go really well with your bottle of Sauternes.